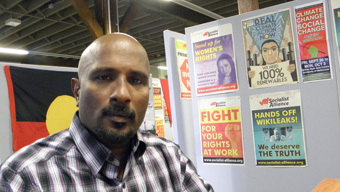 Premakumar Gunaratnam, an ethnic Tamil from Sri Lanka, who now has Australian citizenship, returned to his home country in September 2011 to help organise the launch of a new left party, the Frontline Socialist Party (FLSP), a major breakaway from the Janatha Vimukthi Peramuna (JVP, People’s Liberation Front). He had been a JVP activist for three decades and a member of its underground political bureau since 1994. In an extensive interview with Peter Boyle for Links International Journal of Socialist Renewaland Green Left Weekly, Gunaratnam reported how he was abducted by a group of armed men between 4 am and 5 am on April 7, just two days before the scheduled launch of the new party. Premakumar Gunaratnam. Photo by Peter Boyle. Gunaratnam was driven for 30-45 minutes to another place, where the torture continued in what seemed to be a small office. He remained blindfolded for the next 72 hours, except for a few minutes while his photograph was taken by a man wearing a balaclava. “I saw then, in those few minutes, that it was an office with desks and computers. They were abusing and humiliating me and asking about my political work, the new party, where I had been in the previous seven months and who I was working with. They asked me about the accusations that I had LTTE [Liberation Tigers of Tamil Eelam] connections – a story that had been spread by the government and the media it controlled – but it seemed to me that they did not believe this themselves. Gunaratnam recognised the behaviour of his abductors, particularly in relation to each other, as that of members of the armed forces or the police. Occasionally he overheard phone calls they made to their superiors about what to do with him. Another leading FLSP activist, Ms Dimuthu Attygalle, had also been abducted just the night before Gunaratnam was picked up. However, he was not aware of this at the time of his abduction. During the first few hours of his detention, Gunaratnam heard the voice of a woman who was being interrogated in the same place, a voice he later recognised as that of Attygalle. Later that night, Gunaratnam was moved to a different location. There was such a big public outcry over these abductions in Sri Lanka and in other countries, including in Australia, that the Sri Lankan government came under a lot of pressure. After three days both FLSP leaders were released by their abductors. Two other leading FLSP activists, who were abducted in Jaffna on December 9, 2011, Lalith Weeraraj and Kugan Muruganandan, remain “disappeared”. Gunaratnam was taken to the police by his abductors to the police, who seemed to be expecting him, and later he was deported to Australia. Peter Boyle: What was the political basis of your break from the JVP? Premakumar Gunaratnam: Number one was class collaboration. The JVP had become part of the government coalition in 2004 and had continued this class collaboration since then. Finally, the JVP supported the ultra-rightist former army commander General Sarath Fonseka in the 2010 presidential elections. Since 2001 there has been an internal debate unfolding in the JVP. Over the last decade there was a huge debate in the party about class collaboration. In 2010 there was a convention and 95% of the members had come to the conclusion that they would not fall behind that line [of class collaboration] again. We had a self-criticism and said that this class collaboration was wrong. At the same time we had a self-criticism to some extent of our nationalistic policies in terms of the national question in Sri Lanka. So that was the second issue. But what happened is that the people who controlled the JVP’s registered political party used their positions to work against the will of the party members expressed at the 2010 convention. This took place between August 2010 and September 2011. So last year the conflict came to a climax when these people conspired against some political bureau and central committee members. They conspired to remove four members from the political bureau, including Comrade Dimuthu and Comrade Jayakoda and another two comrades, who were not in the registered party but in the in the political bureau. What exactly is the FLSP’s position on the national question in Sri Lanka? Doe the new party recognise the Tamil minority as an oppressed nationality with the rights of national self-determination? Unlike the JVP, we in the FLSP believe that there is national oppression of the Tamil people and the Muslim people. But in the present circumstances in Sri Lanka we do not believe accepting self-determination or devolution of power for the Tamil majority areas will help to solve the national question. On the contrary, it will worsen the situation. At the same time we believe that there is a national oppression against the minority communities. We believe a solution should be based on democracy and equality but it is not going to be a reality under the present neoliberal capitalism. And also a solution should be able to unite the different national communities but not to divide them. Division of nationalities means division of oppressed classes. It doesn’t strengthen the class struggle but courses further weakening. We do not encourage the drawing of vertical national lines but work towards uniting proletarians of different national communities for the sake of advancing the class struggle. Imperialist powers, including India, preach and encourage so-called devolution of power and self-determination according to their political agenda in the region. But at the same time we oppose the unitary state concept, as it further widens the differences between different national communities. Both unitary and federal state structures represent the same neoliberal capitalism at present. We should practice a socialist program instead a social-democratic program. In Sri Lanka there are number of unfinished democratic revolutionary objectives, including the national question, which has to be accomplished under socialism. The FLSP believes that an effective and practical political program should be implemented to unite the working class and the peasants among different national communities. The “Movement for Equal Rights” is our first move towards this direction. If a capitalist government in Sri Lanka implements some form of devolution of power to the [Tamil majority] north and east would the FLSP oppose it? Devolution of power is a slogan imposed by India. We don’t want to divide the country into ethnic territories. We won’t oppose any form of democratic reform. The Tamil National Alliance (TNA) and the government are pushing power devolution but we are going to explain to the Tamil, Muslim and Sinhala people that this is not a solution for the national question. What is the FLSP’s attitude to the government’s final military solution to the Liberation Tigers of Tamil Eelam rebellion? Do you see it as a national victory? No, no, it is totally wrong and it is not a national victory. Because of this war the armed forces have been strengthened and these armed forces are now attacking the Sinhala, Tamil and Muslim working class. So it is quite clear this is not a national victory. This does not mean that we accept the policies of the LTTE or its methods of struggle in the past. Both the government and the LTTE acted as reactionary forces against the working class. We have made a self-criticism of the JVP’s role in strengthening the government, this right-wing regime and the capitalist state itself over the last decade. Before this decade the ruling class in Sri Lanka was in crisis. It couldn’t form stable governments. They collapsed in 2001 and 2004 but with the JVP’s support it was strengthened, along with its huge military apparatus. What is the position of the FLSP on the demand for the release of political prisoners, most of whom are detained because the government alleges they supported the LTTE? Our position is quite clear. The government should release all political prisoners regardless of their political views. We are holding protests around this demand. Recently the regime released General Fonseka because it suits the regime’s political agenda and not for any democratic principle. There are still hundreds of thousands of political prisoners and they should be released. While the regime has lifted emergency rule but undemocratic laws, like the Ant-Terrorism Act, are still in force. This law needs to be repealed. There are reports that under cover of military occupation in the northern and eastern provinces, the lands of Tamil people have been stolen and given to people in or linked to the military. Is this true? Yes, I believe it is true. First, the military occupied the lands illegally and by force and are implementing what they call a “military plan”. Under this military plan they can use any land in whatever way they want. They are taking the land from their rightful owners and leasing them to Indian multi-millionaires and to Chinese companies. What is the FLSP’s attitudes to the calls for government and military leaders to be brought up to account for war crimes and atrocities carried out during the war against the LTTE? The Sinhala, Tamil and Muslim people were all affected by this war. There were atrocities by government forces and by the LTTE as well. I don’t see that a war crimes investigation imposed by the US or other imperialist forces will advance democracy in Sri Lanka. The Mahinda Rajapakse regime is trying its best to act according to the wishes of the US government. The foreign minister of Sri lanka met with US Secretary of State Hillary Clinton and since the pressure for a war crimes tribunal from the US has eased. The US was only using the threat of war crimes tribunal to pressure the Sri Lankan government into acting according to their agenda in the region. That’s our view. If someone wants to have a real investigation into war crimes it needs to investigate all the war crimes. It is very clear that towards the end of the war, thousands of innocent people were killed by the government forces. But it is also true that over the previous two decades thousands of innocent people were killed by both the government and the LTTE. So a real investigation must look at all the war crimes. What is the state of the ruling class in Sri Lanka today? The governments of Sri Lanka have followed neoliberal policies since 1977 at the behest of the ruling class. It is destroying humanity and destroying our society. But it is not only an economic program it is also an ideology that is infecting the masses and so we have to fight this as well. Neoliberalism is now inside people’s minds. You can see this with what has happened to the trade unions in Sri Lanka. When we were with the JVP we led the biggest trade union movements. But we had time-tabled fights for wages and conditions every year in November and then the struggle would stop and the these fights were easily absorbed by the system. We needed to find a way to turn it, instead, into a fight against the system but we failed to do this. Finally we ended up helping strengthen the capitalist state. The high points of the JVP were marked by strong support from youth, particularly in the south. What is the current state of the youth movement and how are young people responding to the formation of the new party? Unfortunately, the JVP has not been able to mobilise the youth over the last decade. We couldn’t understand neoliberalism and in particular how it was affecting the youth. So our tactics to mobilise the youth did not work. Now, in the FLSP, we are trying to understand the situation. We think that while the working class is the vanguard, the youth are the most energetic and creative section. But now we see that youth are alienated from politics. Actually not only the youth but all the people are alienated from politics so we need to find ways to politicise them. This is our biggest challenge. What is the balance of support between the JVP and the FLSP in the representatives parliamentarians and provincial councils? The JVP fell into pragmatism and relied mainly on elections to mobilise its supporters. Nevertheless the JVP’s electoral popularity has been declining over the last few years. In 2004 we had 41 seats in the parliament. In the 2010 election we only got four seats but we did not contest in our own name but as part of the Democratic National Alliance (with General Fonseka) so there are no more JVP parliamentarians. Three of the Democratic National Alliance parliamentarians support the JVP now and one supports the FLSP. There are a few provincial councillors elected as JVP and they are evenly divided between the JVP and the FLSP. The majority of the JVP’s organisers and full-timers split off and have joined the FLSP. This is in the district organisations, the student, youth and women’s sectors – especially in the youth sector. We had some problems in the trade union section and we are going to form a new trade union federation. We are also going to introduce some new organisational structures as well. We are creating new structures, alongside existing trade unions, to organise the workers’ sector. In the hospitals, for instance, we are forming common unions for doctors, nurses and attendants where traditionally each had their own union. We will also organise with broader than industrial organisations that take up not only the workplace issues of the workers but also their broader concerns. •	If you act with maturity and consideration for other users, you should have no problems. •	Don’t be unpleasant. Demonstrate and share the intelligence, wisdom and humour we know you possess. •	Take some responsibility for the quality of the conversations in which you’re participating. Help make this an intelligent place for discussion and it will be. It is such a shame that things are so complicated in this country. There is no democracy, and anyone who openly wants to get into the political mainstream, is looked at, and treated like a threat, by this ruthless Rajapaksa regime. They rule with violence and threats, and shame on them for using our police and military as goons and thugs. When you lead with nepotism, corruption, violence, you will fear any opposition that comes along. If the FLSP believes that there is a national oppression of the Tamil and the Muslim people and they have been fighting for their right to self-determination, the right thing to do is to support their struggle. I’d advise them to read Marx on the ‘Irish question’ and Lenin on Nations’ right to self-determination. Eh? How exactly does that logic work? Just because one feels oppressed, does not mean there is justification for the creation of another state! The solution is in addressing the oppression! If every minority in this world that felt ‘oppressed’ was to go start violent movements against majorities, we would have an even bloodier world than we already have. The fact to the matter is, after centuries of war, certain populations have realised the solution to division is unity. Not division. Respect the wisdom of those who can see wrongs on all sides, without bias, but don’t condone violence or division, rather unity and equality! Violence and division are tools of the uncivilised! “If every minority in this world that felt ‘oppressed’ was to go start violent movements against majorities, we would have an even bloodier world than we already have”. Please note 40 years ago there were roughly about 105 countries in the world. Now there are about 196 or more. Within 40 years the increase is about 90%. The island of Sri Lanka does not have the muscle to decide financial or otherwise whether it is a unitary state, united state, two nation one country or simply two country in one island. The choice is not yours. All oppressed people have the right to struggle against the oppressors. The recent events in middle east is an interesting case study. Saudi and other tin pot dictators in the middle east are financing and arming the “rebels in Syria” to establish democracy in that country. How interesting? The behaviors of these benevolent dictators would be another interesting case study. Coming back to your point, it is neither the stupid Sinhalese nor the stupid Tamils who would be allowed to decide how the country geopolitically fits into the scheme of things that is decided elsewhere, outside the island. Please pray to mother India if you want to prevent something that you don’t like. If we apply your theory to India, what would happen?.Apart from the geopolitical chaos it will create, we will end up having about 350 to 400 countries.!! Is this practical and is it manageable?.Come on Native Vedda your slip is showing !! Going on that logic, why don’t we just create a state within every family home, or better yet, every person’s bedroom, or a couple’s individual sides of the bed? I think there is an episode of Family Guy in which this actually happens. Human beings have brains, which you would think will help them to get on with one another, by understanding differences and embracing our common grounds. Instead we use these brains to invent weapons and come up with justifications for uncivilised acts such as wars. Why are so many people here so scared of a unified Sri Lanka? Don’t bother answering that question, it isn’t rocket science! Let me explain the logic: The national oppression of the Tamil and the Muslims in SL is not just a ‘feeling’ unless you were living on another planet for the last 30 years. The Tamil people in particular have been fighting against national oppression and this struggle manifests itself in the form of struggle for the recognition of their right of self-determination. has a parochial view of oppression in Sri Lanka. Self-determination is not the same as freedom from oppression. No one group has a ‘right’ to a nation or state of their own. There are many races/ ethnicities without a nation of their own. All people do however have a right to freedom and democracy. Self-determination, or freedom from oppression, therefore does not mean ‘seperate state’. In fact, that is just a lazy solution, and as we can see from the USA, EU etc, there is often more to be gained by coming together (uniting), than dividing. In Sri Lanka, all people are oppressed. The battle for democracy, is therefore common to both the Sinhalese and Tamils. Is it freedom you seek, or is it a state of your own? The two are not quite the same. The solution for the troubles in Sri Lanka is therefore through good governance (functional democracy, with human rights). I don’t think anyone with an ounce of logic or intelligence can argue that splitting Sri Lanka in two will solve the problems of anyone, let alone that if the LTTE had ‘won’, the Tamil people would have been given ‘freedom’. They would have been dished out similar ‘victorious’ propaganda to the Sinhalese, and those who saw the truth, and rightfully demanded more, would have been persecuted. The problem therefore isn’t with the Sinhalese and Tamils sharing a land. It is with the corrupt and oppressive nature of the ruling elites of both sides, and the lack of democracy in the country. Create a true democracy, with human rights and freedoms of speech for all, and there would be no requirement for dividing the small bit of land that we already share. great politician got permanent residence in australia and leader of srilankan politics.another somawansa.please help him to get dwell citizen. If Gunarathnam was abducted by the police, why did he report back to police that he was released by the kidnapers instead going to safe hands , either Australian High commission or American Embassy in Sri Lanka. Tell these crap to the marines. When is the first time democracy tossed from his lips? Can Marx, Lenin, Mao and Pon Kandiah Ex-MP understand this article? What rights Premakumar has to intervine in Sri Lankan domestic politics while holding an Australian citizenship? If he is realy concerened about Sri Lankan people he can help them out in many ways as an Australian Citizen rather than putting his ugly fingers into another countriy’s internal affairs. Would you mind applying this same criterion to the Rajapaksa Siblings who are U.S. Citizens and Sarath Fonseka who is a Green Card holder? Good question. There is a high level of hypocrisy when it comes to one of their own. The Rajapaksa supporters seems fine with green card holders, and US citizens, and do not criticize their intentions. If it is good enough for the Rajapaksa’s, then it is good enough for any Sri Lankan, living abroad, and wants to join the political mainstream. Is this citizenship facts and your comments are applicable to Rajapassa family Also ????????. didnt you there are many foreign passport holders interfearing to sri lankan affairs, not for the betterment of sri lanka . but for their own benefit. when Dogs go rounds, they lift hind quarters to each and every bush they pass. Are you following the same way.????????? The moment he accepted Ausi citizenship (under whichever name) he looses his SL citizenship. All this wit the help from Kangarooland embassy. He should have been liquidated. Sri Lanka needs a form of government similar to Mayaysia or Singapore, where extremism such as JVP or Separatism such as Eelamists are dealt with long jail terms. Hope Mahinda will look into changing the way SriLanka practises democracy which may not be suitable to SriLanka. Kumara, Please read the book by Lenin ” Infantile Disorder” or in Sinhala “Ladaru Valippuwa” , then you will understand what your problem is if you want to accept your mistakes. Not agin about this bomber Gunda. CT does not have any important nes than this looser. Not again about this bomber Gunda. CT does not have any important news than this looser. you except u were in JVP LAST 40 YEARS. WHEN JVP kill innercent unarmed woman and children because their love ones repercent different political view were u member of JVP. Where u the one who gave ok to kill innercent children and woman? The very introduction in this article is flawed. As a matter of fact this man entered SriLanka under the name of Mudalige and not Guneratnam. This underlines the sinister motives of the visit. I suspect Mudaliga/Guneratnam visited the country using an Australian passport under the name “Mudaliga” and then announced to the world that “Australian Citizen Guneratnam” has disapperaed, so that had he managed to leave the country with the new passport, the man Guneratnam would have remained in the abducted and disapperaed people register. Had this plan been successful, it would have been a great propoganda coup for the Tigers and not the JVP or his new party. The Story would have been Tamils are not safe if sent back to SriLanka. It is for Hindians and Indians to decide. However, India as we know it now, comprised of kingdoms of varying sizes and shapes until the white man decided to unify it out of his own interest. Nevertheless India has moved on from British colony to a thriving Federal state listening to and held together with the consent of the regions within India. Indians know where their interest lies. In other words India has recognised diversity within the federal constitution and devolved enough powers to the regions which help to maintain strong bond between the regions hold the different nations together except in couple of troubled parts. There were reasons for the regions to rebel against the Hindians who were in total control. That was then. Now India has moved on from its crude Hindianisation agenda to more sophisticated Indianisation process with consent of the regions. Therefore India has more chances of surviving as country than Pakistan or Sri Lanka. Kashmir has been an exception, where Pakistan has its own agenda and nothing to do with Kashmiries. Free yourself from white man’s thoughts, you might find everything is possible. I am Glad someone like Kumara Gunaratnam emerged as a an alternative for sri lanka and we all need to have a fresh look at the stuation in our island nation and apply lasting solution to our socio economic probelms and i hope FLSP Could deliver in the long time. OK,then as you said we have to divide Sri Lanka into several nations. Sinhalese. Tamil.Up country Tamils, Muslim,Moor,Burghers,and indigenous Vedda people will have to have there own nations. Will it be OK. Please don’t say that Tamils and Muslims, and up county Tamils are speaking the same language,and are one nation. Under the present capitalist system the Muslims and Up country Tamils cannot have there independence,and it will be again like Tamils under Sinhalese.Majority Tamils will also suppress Muslims and Indian Tamils. This will not solve the problem. We the masses, Sinhalese, Tamils,Muslims,and all the rest are all oppressed by imperialist and their goons “The government of sri Lanka”.They should be overthrown together with the unity and might of the all the toiling mass belonging to all communities. I am certain you must be from one of those stupid people who have been contesting to grab our entire ancestral land. Nation does not mean division. A number of nation can constitute a country. It merely confirms the identity of people who live in the country by recognising their diversity. We need some organization to confront this corrupt murderous rogue regime, most of the commentators in this CT forum are lazy armchair critics never sacrificed anything for Mother Lanka, appeasing capitalist rogue corrupt regimes including the UNP which has history of violent killings just like UPFA. All politicians have killed innocent civilians nor difference to JVP or FLSP. UNP & UPFA politicians have amassed wealth for generations ruining our economy breaking down the state sector by appointing incompetent stooges, if we can trace their swiss bank accounts & recover we need not borrow from IMF or World bank . Our dire need is to change this system, rid these two UNP & UPFA, best alternative is the FLSP. Do not believe the paid up capitalist media lies promoted by them against Movement for peoples struggle. Dr Premakumar Gunartham has spent rest of his of last breeting in Australis without any humanright or discramantion by Sinhalese people of Island.We are Sri lankan find our own way for liberation of our people of our soil. No need your assistance or outside guidance nation to overcome 2600 years endurance of nation civilization to seek leaders to be emancipation OUR PEOPLE OF SRI LANKAN. We have much of exprinces of local leader of PDN Wijeweera of so-called SOCIALIST of JVP had been brought misdeed and misdirect life of our youth in 1971 and 1988/89. Dr P Gunartaham your are by products of JVP terrorist outfit of South.You cannot bring more than that. Please find the correct fact first.